I am cautiously optimistic that I have moved back in time another generation with my Irish research. Records of Irish Catholics are limited but I have searched through & evaluated those that are available for County Cavan, Ireland and believe it all comes together to uncover my fourth great grandparents. Previously I knew my second great grandfather was Patrick Coyle, born 20 May 1841 in Moate, Cavan, Ireland. His baptismal record and family information from second cousins gave me the names of his parents: Michael Coyle & Mary Cunningham. They were married 31 August 1833 just over the border in County Westmeath. Witnesses were Terrance Brady & Bridget Cunningham. Michael & Mary lived and raised their family in southeastern County Cavan as evidenced by baptismal records for their children & Griffith’s Valuation & Mary’s death record. Could I learn more about Michael Coyle & Mary Cunningham? Last April I visited the county and met with a researcher at Cavan Genealogy at the Johnston Central Library. She had done research for me and knew I wanted to fill in every little leaf on my family tree. She gently explained the lack of records and that the research she had done was all I would ever discover about my County Cavan families. She had an envelope full of papers which we looked at together. When I returned home I put it all aside because of our son’s wedding & other family happenings. To follow my 2013 goals I have been very closely looking at: the research papers from Ireland, the 1821 Irish census for County Cavan, the photographs I took & maps of the county. 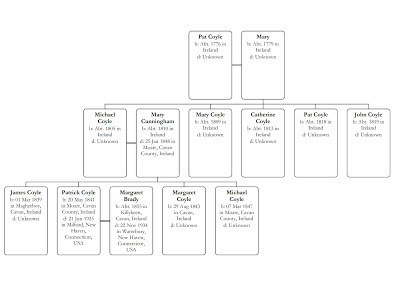 In 1821 in Magherboy there were four Coyle families. Thomas, John & Dennis lived side by side. The fourth house was the home of Pat Coyle, 45 year old laborer. Wife, Mary was 42. Children: Michael, 16; Mary, 12; Catherine, 8; Pat, 3; and John two years old. 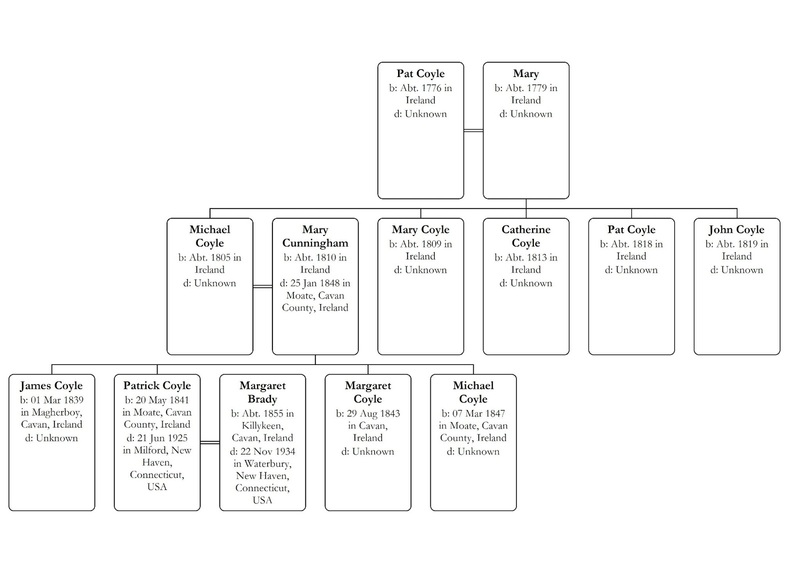 I believe 16 year old Michael was my ancestor who later married Mary Cunningham and whose oldest children were born in Magherboy. Nearby in Pottlebawn was the James Cunningham family. James was a fifty year old farmer. He and his wife had six children: Laurence, 15; Anne, 13; Mary, 11; Catherine, 8; Bridget, 4; and Rose, one year old. 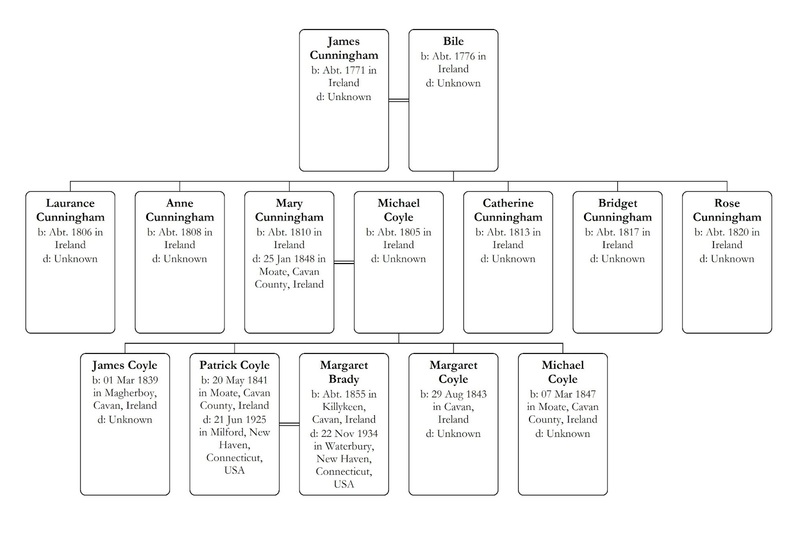 It was the opinion of the Cavan County researcher and my opinion that 8 year old Catherine Cunningham is my ancestor who married Michael Coyle. Their witness, Bridget Cunningham was her sister. Studying maps has shown me how close these locations are to each other. Studying the other Coyle & Cunningham households in the county helped me to eliminate others as our family. I would love to have another source. I have searched roots Ireland & Find My Past & anything I can think to search. 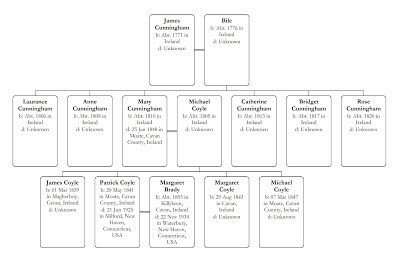 I feel that these two families, Coyle & Cunningham, are my families. I am open to suggestions for other sources to search & opinions on my conclusions. I will cross my fingers & see what my second cousins think. Marriage Record for Michael Coil & Mary Cunningham, Mt Nugent Parish, Co Westmeath, 31 Aug 1833. Baptismal Record for James Coyle, 1 March 1839, Register 33a, page 12, Ballymachugh Roman Catholic Church Records, Cavan Genealogy, Johnston Central Library, Farnham Street, Cavan, Ireland. Griffiths Land Valuation for 1856, Parish of Ballymachugh, Townland of Moat; Cavan Genealogy, Johnston Central Library, Farnham Street, Cavan, Ireland. Death Rocord for Maria Cunningham Coyle, 25 Jan 1848; ‘Parochial Registers of Drumlumman South & Ballymachugh, 1837 – 1935’ 1935’ Diocese of Ardagh & Clonmacnois, Carrick Finea Parish; Deaths: page 16; Family History Library Microfilm #1299229. 1821 Irish Census, Drumlummon, , Cavan Genealogy, Johnston Central Library, Farnham Street, Cavan, Ireland. My connection to the Boreman family comes through my father and Elva Gale Mark [1894 – 1959] daughter of William & Elidia Rebecca (Ritter) Mark. In 1912 she married Myron A Boreman. He was the son of John & Ella Boreman. Myron was a farmer. ‘Irish Lives Remembered’, edited by Eileen Munnelly and designed by Michael Munnelly, is a terrific monthly online magazine full of research tips. I first discovered this treasure and posted about the County Cork resources included in the June issue. 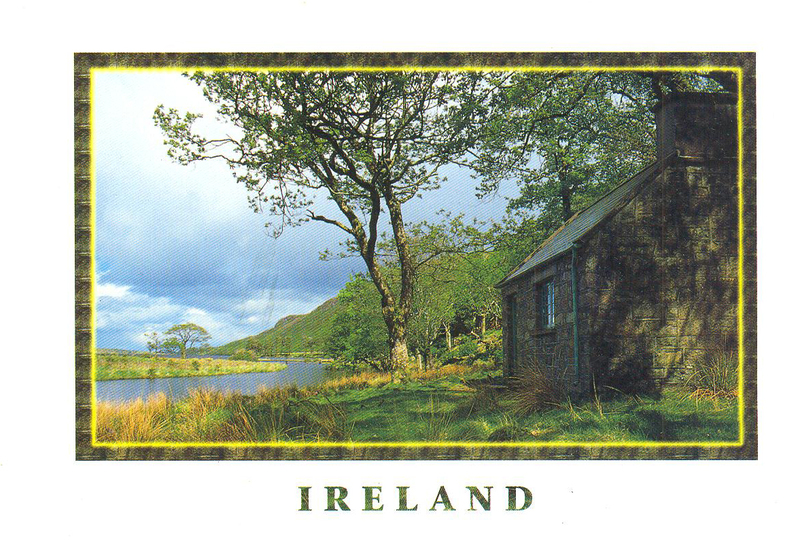 Each issue focuses on a different county in Ireland. January’s issue focuses on County Westmeath and gives many ideas on finding your Westmeath ancestors. There are details on the Dun na Si Heritage Centre for genealogical research. Libraries & archives are discussed. It suggests a visit to Athlone Castle which has been renovated recently. Kevin McCormack has an article about Valuation Records. John Martin writes about Railways in Local and Family History. This issue also includes: Book reviews, Tips on Family Artifacts, Identifying Family Photos, the Importance of Flags & Emblems, information on The Gathering & more. Reading the magazine is free. I like to read it in PDF format. I even enjoy the advertisements! If you are interested in Irish research and you read this you won’t be disappointed. Surprises can be, well, surprising! I was surprised to receive the Wonderful Team Member Readership Award from Wendy at Jollett, etc. Wendy has an appealing and informative blog that updates her research of the Jolletts of Virginia and their offshoots. We have been visiting each other’s blogs for a long time. Thanks, Wendy, for your continued support, inspiration & for this award. I’d like to send this right back to you. Be sure to visit Wendy’s blog: Jollett etc. Blog reading is fun. I just love reading other blogs. 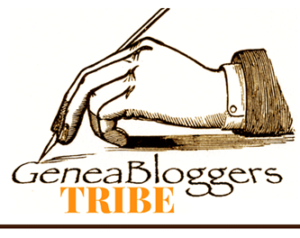 I like reading ‘May I Introduce You to…” at Geneabloggers because it is a great place to ‘meet’ new people, see their work and be motivated to improve my own writing. 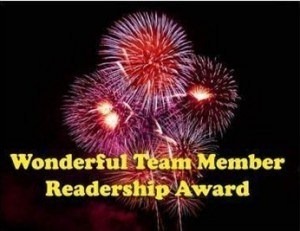 Part of this Readership award is to pass it on. My first reader was my daughter, Alyssa, who has her own blog: Vegtopia [delicious Vegan recipes] & facebook spot Grape Keeper [wine!]. She deserves this award for reading & tech support. I’d like to pass this on to Charles L. Purvis at Carolina Family Roots. His posts are scholarly & he inspires me to always cite my sources. Charlie, thanks for reading & commenting on my posts. I’d also like to send it on to Louise at The Story of Our Ancestors, my most recent reader. It is always nice to share with ‘new’ people! She inspires me to reach out to more readers. A great reader is someone who shares, supports & motivates me to improve my research & writings. Keep Blogging & Keep Reading! Take a moment to look over these surnames. I post them in hopes of discovering new contacts to expand my knowledge of these names. Some of these surnames are more twigs than branches on my tree. It is time to let them out to get some sunshine & some attention. I probably have more ‘B’ surnames than any other letter, so relax, sit back & scroll down. This surname comes from my husband’s family. His grand aunt was Mariana (Pascale) Bagnato, b 1887. Her parents were from Italy. She married Joseph Bagnato. I have an assortment of Ball cousins, mostly located in Louisiana and Texas. James Alton Ball, b 1902 in LA, married my great grand aunt, Mildred Olga Brown, b 1904 in MS.They had 10 children. Jesse Ball [b 1808], married my 2nd great grand aunt, Cynthia Ann Alford. Anice Ball [1843 – 1912] married my 2nd great grand uncle, Seaborn S Alford, MD. Robert E Ballard, b 1891 in Indiana, married my grand aunt Vera Victoria Mark, b 1905 in Ohio. Pennsylvania is the location for this surname. Jacob Balliet married Barbara Ritter, b 1761 in PA. They had three children. George Bennett married Mary Alice Alford [b 1920 in LA] my 1st cousin once removed. They had four children. Robert M Beriswell [1932 OH - 1986 in OH] married Francis Edith Brophy [b 1941 in Ohio]. Their four children were born in Ohio. Two different Berryhill families: Mark Anthony Berryhill married Nancy Jane Alford, b 1845 in LA. Addie L Berryhill married William J Ellzey. Samuel A. Balckwell [1828 – 1910] married Violette Jane Fortenberry [1835 – 1857]. The Blades in my family come from Louisiana & Mississippi. The long list of cousins reach back to Benjamin Blades who married Hollander Elizabeth Morris, b 1829 in MS & d 1868 in LA. Amelius Boergeon, b 1846 in Germany, married Caroline Gruissy, b 1844 in Ohio. Their three children were born in Ohio. Smith Sebastion Boney [b 1841 in Ohio] married Matilda Jane Ritter [b 1866 in Ohio - d 1914]. Three children b in Ohio. This is an Ohio family. Myron A Boreman, b 1893 in Ohio, married Elva Gale Mark [b 1894 OH - d 1959 in OH]. Four children. Brady is one of my major surnames. They came from County Cavan, Ireland. Thomas Brady, d 1914, married Catherine Gibney [b c 1818 - d 1873 in Ireland]. They had 9 children. Some stayed in Ireland. Others came to New Jersey & Connecticut. This name comes from my husband’s family and reaches to Italy. Carmen Brigandi, b c 1881 in Sicily, married Angela Valenti, b c 1876 in Sicily & d c 1934 in New York.Six children, born in Sicily & New York. This surname comes from the south. Samuel Ruffus Brock [1914 – 1989] married Iris Elizabeth Pierce. They were born & married in Mississippi. William F Brock married Cynthia E Alford, b c 1851 in Louisiana. I can trace this surname to Ohio and William Clarence Brophy, b 1888. He married Frances Gertrude Moore, b 1888. They and their 3 children were b in Ohio. Brown is my maiden name. I have many, many Browns in my records. At this time I can trace back to Edward Brown [b c 1730 - d c 1797] in North Carolina. The family moved, over the years, to Mississippi & Louisiana. My paternal grandfather moved from MS to Ohio and later to New York State. This is another large limb on my family tree. For me, this family moved from Virginia to Louisiana to Mississippi.John Brumfield [b c 1768 - d 1834 in LA] married Margaret Kelly b 1772 in NC. Their son, Nathaniel Brumfield b 1813 in LA, married Charlotte Temple Ott, 1815 – 1895. Their son, Jessie Alexander Brumfield, b 1838, married Martha Elizabeth Alford, b 1846. The names expand from these men. My third great grandmother is Elizabeth (Burkholder) Wolf, [b 1814 PA - d 1856 Ohio]. I believe her father was Abraham Burkholder. I would love to learn more about this surname. 1. 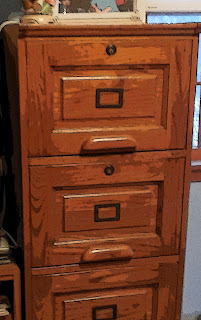 Straighten up my genealogical library [once our daughter’s bedroom & now a guest room] so work can be done easily & efficiently without having to sort through piles of papers, journals, maps and photographs that need to be filed, scanned or recycled. This took longer than I had anticipated. I thought that I had it pretty much under control & I only had to file a few papers and photographs to achieve my first goal. I know it’s good to have a relatively easy first goal to inspire myself to move on to the next on the list. Well, the pile of papers was taller than I remembered. Shoving them in a drawer was not an acceptable option so I started sorting them into piles. There were family group sheets I had printed from my own records, letters from cousins, photocopies of select pages from state and county history books, a letter from a cemetery, etc. I started by sorting everything into two categories: people & places. People go in my cabinet. People go into my file cabinet. Basically each of my grandparents has a drawer in the file cabinet. 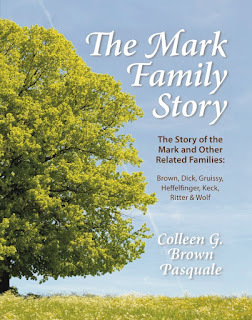 For example, my paternal grandmother was Ivy (Mark) Brown, born in Ohio. In her drawer I have folders for her parents, her grandparents, great-grandparents & her siblings and their children. There are also folders for cousins I have found, related to these families, with whom I share information. I filed away the letters and family group sheets in the right folders. The folders hold: birth, marriage & death certificates, newspaper clippings, obituaries, letters, report cards, Christmas cards, military service records, etc. My file cabinet is full of people and paper records related to them. Everything has been scanned into my laptop before going into a folder. Places go on my shelves. Places go on my bookshelves. Like my file cabinet, each of my grandparents has a shelf. My paternal grandfather, Roy Jesse Brown, was born in Mississippi. Many of his family came from southern states. I have hard cover books like The Fortenberry Families of Southern Mississippi by Criminger and Passports of Southeastern Pioneers 1770 – 1823 by Potter. I have three of Gregory Boyd’s wonderful books of maps of Mississippi counties. 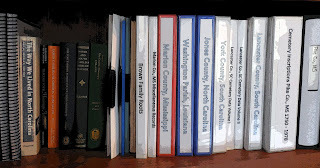 I have binders of various counties where my ancestors’ lived. 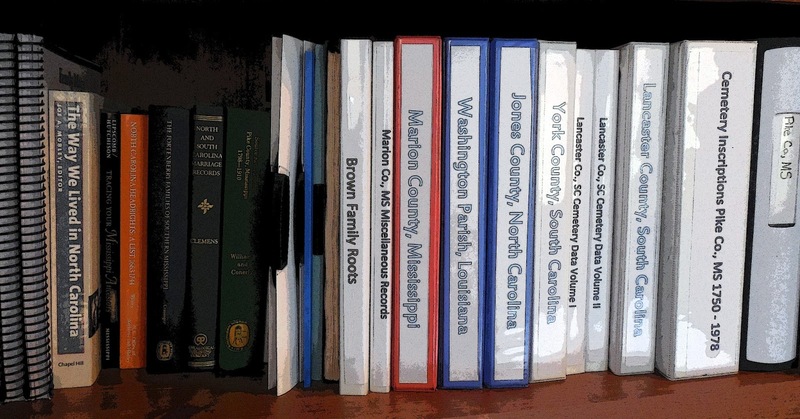 The binders hold photocopied pages from local histories, cemetery or marriage records, information about archives or libraries I have visited in the county, etc. Organizing my research in this way works for me. I was able to get everything tucked away in a place that I can find if when I need it. When I was teaching I discovered that the best teaching tools in the world were no good if I couldn't find them when needed. The same is true in genealogy. Find a system that works for you. My library is straightened up & I hope to keep it that way. Goal #1 accomplished! Grab your pencil & paper. Once again it is time to write your family story. Set your own goal and join the challenge. As genealogists we spend hours on research: carefully sorting through information on the internet; hunched over microfilm readers reading faded records; and traveling many miles to visit out of the way archives. We photocopy, scan, sort and file our findings. We build a picture of our great grandparents’ lives. Isn't it time to share what we have learned? There’s always one more question to answer; one more missing piece in the story. We don’t need to know everything to start sharing. The Family History Writing Challenge in February will help motivate and guide us all in the writing process. Connect with others. Ask questions on the forum. Learn tips about styles of writing. I joined this fun group last year. 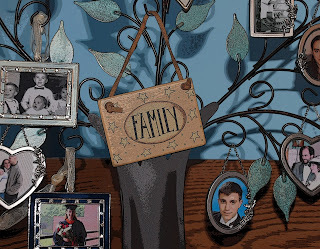 I thought I’d write about my mother’s family but switched to my paternal grandmother’s family. I did not finish the story in February but it was a start. 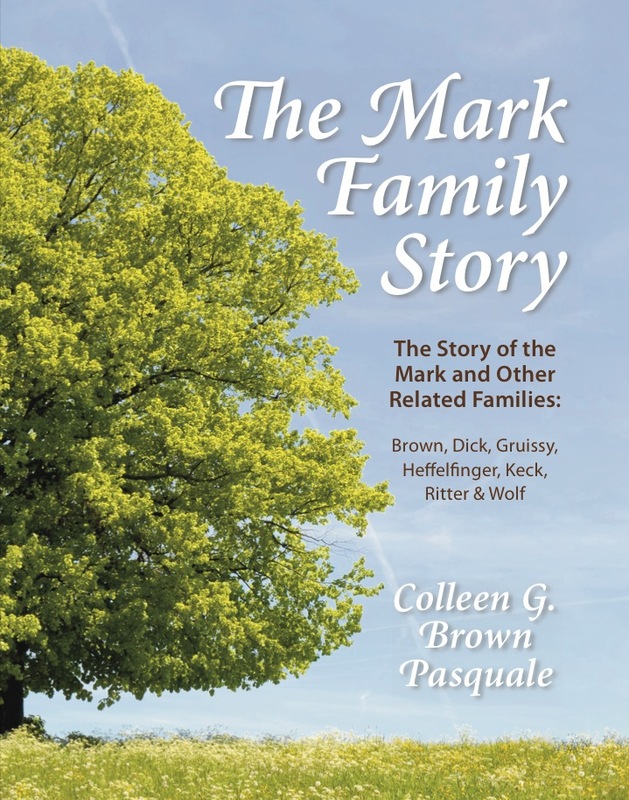 By the end of the year I took my story, ‘The MarkFamily Story’, to a local self-publisher and by Christmas I had a beautiful book to give to my family. 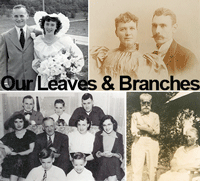 Go to the Family History Writing Challenge & learn more. Read my post from last year’s challenge. Tuesday's Tip - A Helpful & Fun Book! I discovered this book in searching the online database for my local libraries, the Upper Hudson LibrarySystem. When I had the book in my hands I started flipping through the pages immediately. It is not just a dry listing of resources. Rather it is a fun read with charts, photographs and maps that pull your eye to the page and information that keeps you on the page. This year when my children asked for Christmas gift suggestions, this book went on my list and I was delighted to unwrap it on Christmas Day! Thanks, Alanna & Dave! Information is included on vital records, gravestones, newspapers, school registers, land records and more. I also like some of the ‘little’ information included: the most popular male & female names in 19th century Ireland; Gaelic words commonly used in Irish place names; Irish emigration statistics; and Latin words commonly found in Catholic parish registers. David Ouiette writes about visiting Ireland. He writes, “You may choose to order a search at the Irish Heritage Center In your ancestor’s county; do this before you go to Ireland, so you can review the results well before your trip.” I wrote to County Cavan well before my trip to Ireland and picked up the results of the search while I was there. I was able to talk face to face with the person who did the search. It was wonderful. But as Mr. Ouimette suggests, it must be done in advance as these searches may take weeks. This is just one of many helpful tips in his book. However, this book is not just for beginners. I think Irish researchers of all levels will enjoy this book! I have a very long list of Alford connections. My Alford family can be found in Louisiana, Mississippi, North Carolina & Virginia. The earliest Alford I have uncovered was John Alford c 1645 in Virginia. Edwin Barksdale Alford [1792 NC - 1878 MS] was my third great grandfather. I have several Amacker relatives, related to me through Thelma Corine (Wilson) Amacker [born 1912]. She married George Amacker [b 1908]. They had five children. I have no locations for this family. Mary Elizabeth Tina (Wolf) Arbuckle [1891 – 1956] is my link to this family. I have no locations for this family. She married Jesse Lee Arbuckle and they had four children. Catherine (Wolf) Arnold [1858 – 1918], my second cousin 4x removed, is my link to the Arnolds. She and her husband, Henry Leibe Arnold, had twelve children: A. Gertrude, Henry Chesterfield, Robert L., Lillie May, Jacob Raymond, Charles Edwin, Mary Catherine, Philip J., Morgan Eugene, Vera Pauline, Samuel James and Helen Irene. They lived in Pennsylvania. Thomas Ashley, Junior was my 7th great grandfather. He was born c 1710 and died 1790 in Bertie, North Carolina. He & Ann Hicks had three children that I know about. Listing my goals helps me to focus on the branches of the family that need attention. I have a tendency to wander off the path, through the trees and get tangled in the thickets. Goals are also good at the end of the year to evaluate what I have accomplished. I know, at a glance, if I can pat myself on my back. Below are my newest aspirations. 2. Broaden my knowledge of my mother’s father’s family: the Gardner family in Austria. This means learning how to search for Jewish records. 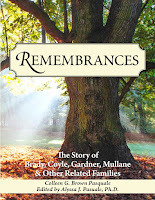 3. Review & Organize the materials I have collected about my mother’s family: Brady, Coyle, Cunningham, English & Mullane. Take a last look for holes that need to be filled & fill them. 4. Decide on the format for the book on my mother’s family. My outline needs finalizing. I need to look it over to be sure it flows in a logical and interesting manner. 5. Write my findings. I plan to publish a book on my mother’s family. I have put this off for too long. This is a firm goal for this year. 6. All along the way I will use my blog and my website to share my findings and my questions with my family. 1. Are you kidding? I hope to just finish last year’s goals!